The rest of the article drives home a prescient point: renunciation of US citizenship is an emerging trend that, while still in its infancy, is growing. So why are so many people doing this, or at least considering the option? There are a few reasons. For many, it’s about money. They live, work, and invest overseas, and none of their income is earned from US sources; yet, the US government still has its hand out for a portion of their profits. To many expats, this is unjustifiable and abusive: forcing people to hand over a portion of their labor and receive no benefit in return is akin to slavery. Expats who renounce US citizenship are freed of this parasitic relationship; they can focus their efforts on things like providing value and growing their businesses, and not thinking about ridiculous and unproductive tax strategies. For other people, the decision to renounce is rooted in a serious disagreement with the direction that the country is headed. They don’t like war, socialism, big government, or the erosion of civil liberties. While no country is perfect, they realize that there are much greener pastures elsewhere. Their renunciation is a declaration of independence– a declaration of self-reliance in a turbulent world. In time, I’d like to open a larger discussion about this issue because it’s such a growing trend. Today, though, I thought I’d dispel a few myths about expatriation because I hear these sorts of things all the time. My personal favorite is the commonly held belief that if you renounce your citizenship, you will end up on some list… and they won’t let you back into the country. This is simply untrue. If you already have another passport from a visa waiver country (like Canada or Germany), you could enter the US the very next day. If your other passport is from a non visa waiver country (like St. Kitts or Panama), then you would have to go through the process of applying for a US visa at a foreign consulate just like everyone else. The thing is, one of the primary missions of consular officials at foreign embassies is to determine whether visa applicants might intend to overstay their visas and illegally reside in the United States. Clearly, someone who has just renounced citizenship is in no danger of becoming an illegal alien. As such, it’s pretty easy to apply for and receive a 10-year multiple entry visa, unless you’ve managed to land on a terrorist watch list or have a serious criminal record. 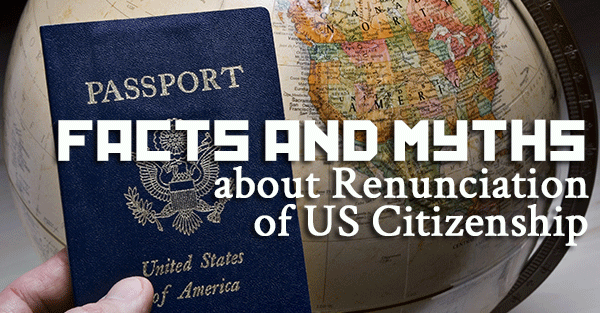 This leads me to the second commonly held myth about renunciation– people think that if you renounce US citizenship, you can only spend a short amount of time in the US each year as a foreigner. This is also untrue. Most multiple entry tourist visas are good for 90-days per visit; they can be extended through application, or simply by exiting and re-entering the country at a later date. The biggest thing you have to watch out for, though, is falling back into the US tax net. Generally, after 4-months a non-resident foreigner would become subject to tax on his/her worldwide income. This is common in many countries– New Zealand, for example, has a six month window for non-residents. Another big misconception is that renunciation reduces your capability to travel. Sure, a US passport is pretty convenient in that you can travel to quite a few places visa-free, but there are easy alternatives. St. Kitts, for example, has an simple economic passport program that provides visa-free travel to Canada, Europe, Hong Kong, and dozens of other countries. Brazil and Singapore are also great options, and fairly easy to obtain. The point is that visa-free travel need not end because of renunciation; in some travel cases, renunciation can even be a benefit. After all, no one has ever hijacked a plane and threatened to kill all the St. Kittsians. Lastly, there are a lot of misconceptions about loss of benefits. If you have retired from the US military and renounce citizenship, you -will- lose your retirement pay. Check out DoD Financial Management Regulation Volume 7B, Chapter 6 for more information. Social security, on the other hand, is not forfeited; one would continue to receive checks as a non-citizen, at least until Social Security finally goes bust. I plan on discussing this topic a lot more in my free newsletter Sovereign Man: Notes from the Field. You can sign up with your email below, for free.